ATHENS EXPERIENCED A rare snowfall today, two days after Greek officials said three people had died following stormy weather and freezing temperatures across the country. Temperatures reached minus 23 degrees Celsius in the north of the country, and authorites confirmed that schools will remain closed on Wednesday, the town hall of northeastern Kozani told the ANA news agency. Many employees stayed away from work as the snow created traffic problems for a populace unused to driving in the freezing conditions. But Antoine Viredaz, a Swiss researcher visiting from Lausanne, was delighted by the unexpected snowfall. “I was not really expecting that much snow, but it’s great,” he said. Dozens of refugees housed in tents at a migrant camp in northern Greece protested their harsh living conditions as temperatures in some areas sunk to minus 20 degrees Celsius. Snow was also reported on many of Greece’s islands, and a new cold snap is forecast in the country from Thursday. On Sunday, Greek officials said that the freezing conditions had claimed three lives. Rescue services have received dozens of calls to help people trapped in their cars or homes by heavy snowfall. And on Saturday, firefighters rescued a pair of French hikers stranded in a forest on the island of Lesbos. The poor weather has also disrupted travel, forcing highway closures and coastal ferry and intercity train cancellations. On Friday, a Ryanair flight bound for northern Thessaloniki was rerouted to Timisoara, Romania, because of poor visibility. Email “Temperatures plunge to -23C in Greece as Athens experiences rare snowfall”. 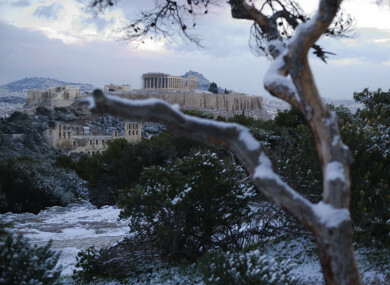 Feedback on “Temperatures plunge to -23C in Greece as Athens experiences rare snowfall”.